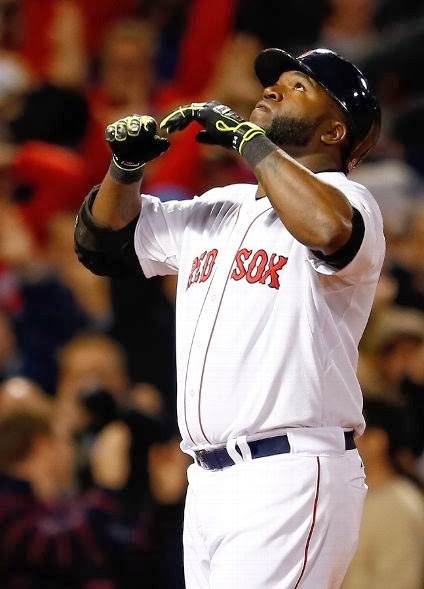 David Ortiz blasts a game-tying grand slam, boosting Boston to a Game 2 win. The Red Sox had one run on two hits. Max Scherzer had struck out 13 batters through seven innings. Jose Veras came on in relief of Scherzer. Jose Iglesias replaced Jhonny Peralta at shortstop. Boston’s current shortstop Stephen Drew grounded out to Iggy to begin the eighth inning. The Red Sox were down to their final five outs before suffering a blow that would put them in an 0-2 hole heading to Detroit for three games. Drew Smyly entered the game. He walked Jacoby Ellsbury. Al Alburquerque was next. He got out No. 2 by striking out Shane Victorino, the 14th of the evening. Two outs. Dustin Pedroia’s inside out swing produced a single. And Brian Butterfield held up Middlebrooks at third with Torii Hunter coming on strong in right field. Good decision. Joaquin Benoit was summoned from the bullpen. David Ortiz was up next. Big Papi with the bases loaded. The man who carried the 2004 Red Sox on his back en route to a World Championship. There’s no possible way he could do it again, right? Improbable, sure. Impossible? Nuh-uh. Sometimes, you just have to believe. One pitch is all it took. One pitch caused bedlam in Boston. One pitch turned this series around. Boom. Grand slam. Tie game. Fenway frenzy. It wasn’t over, but it was all but over. The Hollywood ending began with the brightest star on the biggest stage doing what he does best. following his game-tying grand slam. Relish in what you’re witnessing, Red Sox Nation. Cherish every at-bat this postseason when No. 34 steps to the plate. Papi is a legend. He’s the best designated-hitter in baseball. He’s the best clutch hitter in baseball. You know those stories your grandpa has told you about Ted Williams? In 30 years, you will be doing the same with your grandchildren - if you're fortunate enough to be alive and have grandchildren then. You will stop by that statue of Ortiz outside Fenway Park and take pictures, telling them the countless times Ortiz came through in 2004. You will look up at the facade and see the retired "34" up there with Red Sox greats of the past knowing you will never see another Sox player wear that hallowed number. 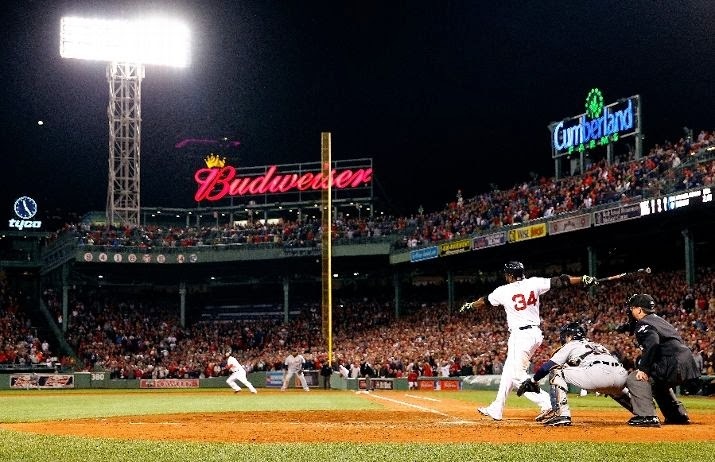 Oh, and you will remember that magical October 13 night in 2013 when he took Red Sox Nation from the lowest of lows to the highest of highs. It just doesn’t get any better than this. This is what we love about baseball. This is what we love about Boston. This is what we love about Big Papi.